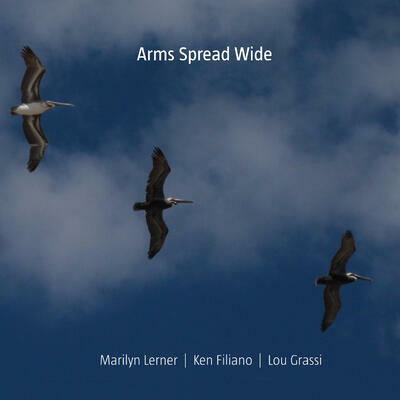 Another notable trio performance is that of Canadian pianist Marilyn Lerner with New Yorkers, bassist Ken Filiano and drummer Lou Grassi on Arms Spread Wide (No Business Records NBCD 5). It’s obvious that there would be no Christmas – or Christianity – without Judaism, and the most affecting performance here, Hommage a Coco Shulmann, honours a German-Jewish guitarist and Holocaust survivor. His statement that “once a man learns to swing, he can never march again” not only describes much of the fine music here, but underlies the pacific message of Christmas. Musically, Grassi’s clanking strokes and Filiano’s pumping bass complement the jaunty narrative, during which Lerner moves from andante swaying to high-frequency key tickling with an angled bass line. Mercurial in her playing, exhibiting uneven rhythmic pulses and moving in-and-out of tempo with cascading tone clusters and singular clipped notes, Lerner treats the title tune lyrically and dramatically. Following an initial hunt-and-peck keyboard exploration, she works up to super-fast vibrations and dense, tension-filled runs. With Grassi’s press rolls and tom-tom strokes plus Filiano’s spiccato string-slashing, she eventually downshifts to gentle patterning.